Thank you for joining NOSORH with your Pledge to Partner. On National Rural Health Day and every day, we share a common goal in that we believe in the power of collaboration, communication, education, and innovation to help strengthen our reach and service to nearly 60 million people living and working in our nation’s rural communities. The Power of Rural platform is ambitious. As you know, we aim to transform a single day event into a sustainable movement. Your partnership and support for the Pledge will help us achieve this goal. We have developed several NRHD toolkits, and one specifically designed to help our Pledge Partners promote their support for The Pledge to Partner, the Power of Rural message, and National Rural Health Day. 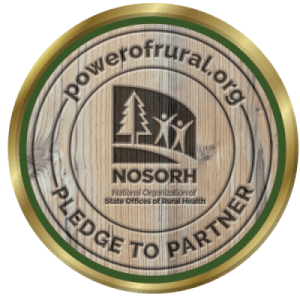 The Pledge to Partner seal and NRHD logo can be displayed on your website, used in your social media posts, and included in the material your organization develops to work with your rural stakeholders. Be sure to check out our other toolkits in support of NRHD and remember to use #PowerofRural in all of your social media on 11.15.18.